💛 This yellow heart exploits the idea that the most coveted precious metal on earth, gold, also has a yellow color. Sending someone a heart, a symbol of love, also made of gold, says that you unlimitedly appreciate those to whom it was sent. In contrast to passionate love, which symbolizes the red heart, this one symbolizes platonic feelings or profound friendship. Not for nothing in snapchat this badge denotes your best friend, the one with whom you communicate most. 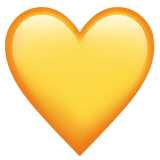 Yellow Heart Emoji was approved as part of Unicode 6.0 standard in 2010 with a U+1F49B codepoint, and currently is listed in 😀 Smileys & Emotion category. 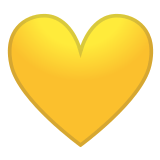 Use symbol 💛 to copy and paste Yellow Heart Emoji or &#128155; code for HTML. This emoji is mature enough and should work on all devices. You can get similar and related emoji at the bottom of this page.